Earlier this month, before flying to Manila for Bloggers United 4, I did a shoot with Vanessa for Topshop. Precious, the Associate Consultant for the well-known British brand, asked us to select our top picks for this season. 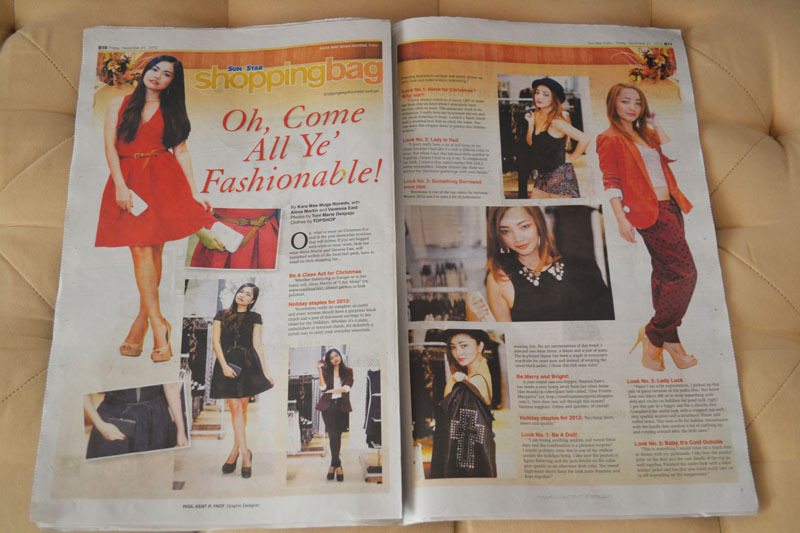 The feature came out in Sun Star's December 21st publication. 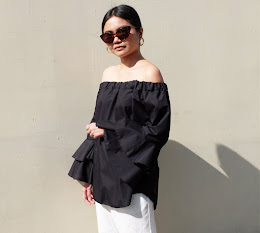 For those of you who missed it, you can check out below the first of the three looks that I put together. What are your Holiday Staples for 2012? Accessories really do complete an outfit and I think every woman should have a gorgeous black clutch and a pair of statement earrings in her closet for the Holidays. Whether it's a plain, embellished or textured clutch, it's definitely a stylish way to carry your everyday essentials. Donning bejeweled earrings will surely spruce up your look and make it more interesting. Look No.1: Black for Christmas. I have always relied on a classic LBD to make me look chic on days when I absolutely have no clue what to wear. This particular frock is no exception. I really love the structured sleeves and the mesh detailing in front. This has got to be one of the most beautiful dresses I have ever seen. I mean look at the fabric's gorgeous embossed pattern! I added a black clutch and a studded bow belt to cinch the waist. You can wear this elegant dress to soirées or to New Year's Eve parties. All clothes and accessories from Topshop. @Chyrel: I know, the dress is really pretty and perfect for the Holidays! :) Merry Christmas to you, too!